← Cake in a Mug – Just for Fun! Those of you that were already with me this time last year will know that now is the time to start on your Christmas Cake (yes, really!). Soaking the fruit for a good six weeks before we even bake the cake. If you’re Christmas crazy like I am you won’t mind one bit starting early. 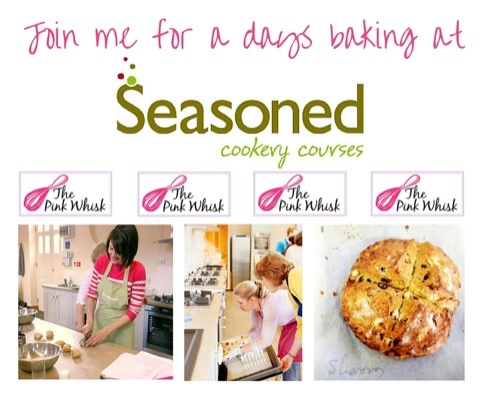 Forgive the duplicate post, but a year on we have 4,500+ more Pink Whiskers baking along and I really don’t want anyone to miss out, plus there are a couple of extras, making your Christmas cake and boozy fruit even better! The quantities will make you one 8″ round cake, if you make cakes for the whole family multiply the ingredients by the number of cakes you’re making. See my ‘making boozy fruit en masse’ notes at the end, and, if you’d like you can read the original post here. 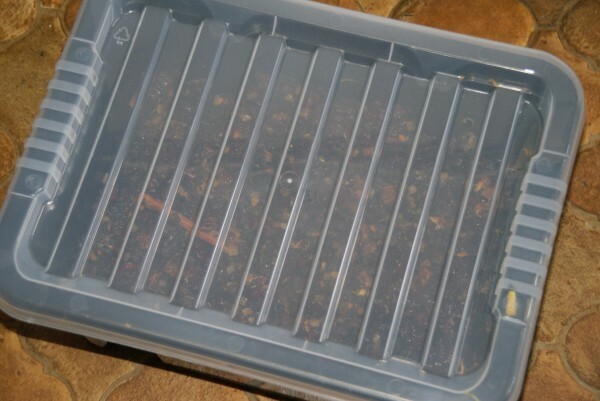 You should have a total of 730g dried fruit – the above is just a suggestion, if you’d like to add something else if then go for it – cherries, craisins etc. Similarly if you don’t like something change it for something you do! 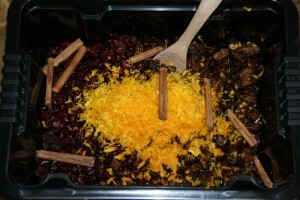 Place your chosen dried fruit into a large bowl with the grated zest of the orange and the cinnamon stick. Add the sugar and water to a saucepan and heat gently until the sugar is completely dissolved but don’t let it boil. The syrup should be clear. Remove from the heat and allow to cool slightly. Add the warm sugar syrup to the brandy and stir. Pour over the fruits in the bowl and give it a good mix. 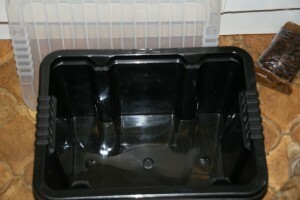 Now transfer this to an airtight storage container (a 1.5l container is big enough). 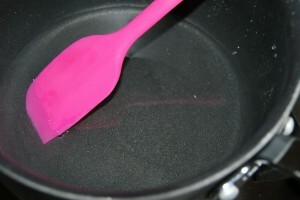 For a week you will need to stir it every day, then for a further five weeks give it a mix up just once a week. Believe me it’s worth it just for the smell of Christmas you get every time you open the lid! 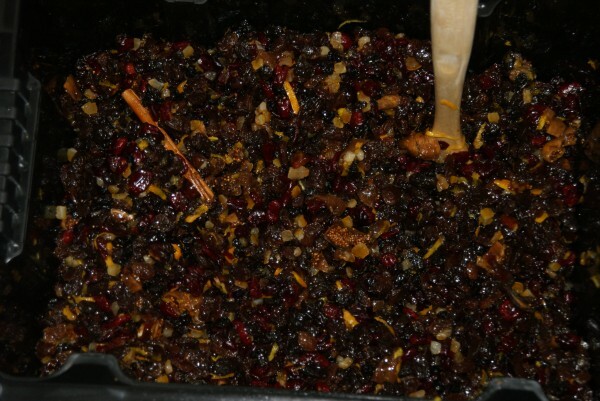 Six weeks soaking and you will have the most fab fruit to make your Christmas cake with, I’ll be back of course with a reminder on how to do it but the recipe is here if you want a sneak preview. If you’ve already set your boozy fruit in motion from last years recipe add in the grated zest of an orange and a cinnamon stick for an even lovelier tasting cake. Store ideally in a kitchen cupboard or on the worktop as long as it’s not in direct sunlight. It doesn’t need to be in the fridge, just somewhere at room temperature. If you’re running late – a weeks fruit soaking is better than none and you will still come out with a lovely cake, the longer the soak the better the flavour. If you prefer to make a cake that’s alcohol free make a syrup by heating 200g caster sugar with 200ml water, once dissolved pour over the fruit and then soak and stir as above. I’m going to need a big container! In goes the fruit, added a few craisins as I ran short on the fig front – actually the colour of them looks lovely. Grated the zest in from 10 oranges whilst sat on the kitchen floor. I couldn’t lift it back onto the worktop. Now proceedings halted briefly when I had to run out for another bottle of brandy because I didn’t have enough…. Lid on and it’s now sitting the in the hallway to greet visitors/delivery men with a good waft of boozy fruit when they come a calling! This entry was posted in Cake, Christmas, Treats. Bookmark the permalink. Ohh Ruth I was so excited to see your post- I LOVE the idea of getting ready for Christmas in September (heck it is my favourite time of year too). This recipe is most definitely getting bookmarked, thank you! Made your cake last year, It was fantastic. Plan on soaking the fruit for this years cake as soon as I do the shopping. Hi Ruth,I’m crazy for cranberries at the moment so think I’ll substitute some of them in. Some Australian macadamias too, added after the soak as you suggest. With it warming up now here down under, would refrigerating the soak be in order ? Well, must say that thanks to you and your helpful tips I have just produced nine (an extra one just appeared) and two large CHristmas cakes that went down a treat here in australia. The six week boost soak is a must and my cranberry/nut combo (omitting glade cherries and peel as I don’t like them) was a real success. I got more than one kiss from my recipients for my trouble, so owe you big time. I must say that I prefer the smaller cakes in tms of moistness and flavor, don’t know why but they just taste better. I will definitely keep reading your blog and will endeavor to keep up as best I can. Happy 2012 ! Was really looking forward to your recipe, tried it last year and wondered if you’d tweak it as I’ve already got orders from the family to make them again. I think I’ve started a trend which will see me making it every year. It was just so nice to try it last year with all the months of effort coming together for Christmas. Carry on your great work and love the new website! I am biased though. Hi Ruth, if you’re not a fan of booze what alternative would you suggest and should I still start soaking the fruit this early? Hey Ruth – I will be soaking along with you! Got lots of orders for my Christmas cakes this year as last years was so gorgeous! Just need to get my holiday out of the way and then I will soak! Wow! I love the new look of the website, it looks so clean and polished but cute at the same time – perfect! Ahhhh! Mine’s been on the go for a fortnight now. I’ll add the orange and cinnamon tomorrow. My fruit must have been very thirsty because there isn’t any liquid left. Does that sound right? It’s lovely and sticky and plump though. Oh my goodness, that’s a huge cauldron of brandy soaked fruit! I made your boozy fruit cake last year, and it was (is) delicious – there is about a slice still left as I didn’t want to eat it all up! 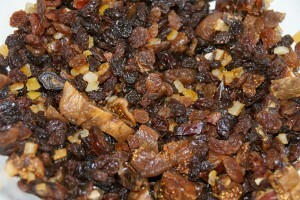 It was my first Christmas cake, and I used Amaretto as well as brandy, as I didn’t have enough – scrummy! My- what a quick year! Will get started on this at the weekend. Thanks for the reminder. Love the new web site – although when it first came up I thought the raspberry macaroons were teeth!!!! I’m finally attempting my first Christmas cake this year after wimping out every previous year! Your recipes haven’t failed me yet so wish me luck! One question though (albeit a very silly one…), the cinnamon stick you put in the fruit, when it’s time to make the cake do you fish it out or will it melt/dissolve into the mix? p.s. love the new look blog! The question… do you sell your cakes at the fair? And if you do, how do you go about pricing them? Oh my days – the thought of all that fruit and baking 10 Christmas cakes is terrifying! I usually only soak my fruit overnight in a brandy and orange mix though so will try your version. Loving the new look Ruth and huge congratulations on your listing in The Independent’s Top 50 Food Websites – that’s some achievement when you think how many sites there are! Off to make a shopping list for that Christmas cake I think…….. Okay – my boozy fruit is underway & I’m excited to try your recipe. I love your recipes as they are practical, and clear – and they work! It’s great to follow instructions from someone who cooks for a family. 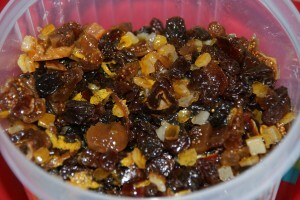 First time making your Christmas Cake and can’t wait to try it. The smell in my kitchen is very festive! This recipe sounds fab. Going to make my first cake this year 🙂 What Brandy did you use and would it be ok to swap some of the fruit for Glacier Cherries? Well that’s me just finished making 2 lots of boozy fruit mixture!! 😀 Smells wonderful already. 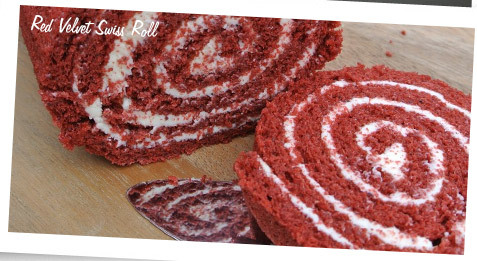 Thank you so much for sharing this wonderful step by step recipe! I’m just getting into baking and am hoping to use Ruth’s 12 Days of Christmas to make Homemade Hampers for my family and friends this year. Just made up my first two batches of Boozy Fruit and they smell divine! Can’t wait to crack on with the rest of the goodies now! found a jar of fruit in the back of the larder from last year!!! Can it still used or would it be better in the bin? Just checked the fruit. It was kept in an airtight glass jar at the back of the cupboard and it smells and looks perfect! Now that’s one job ticked off the list. I’ve been looking all over the internet and books to find a christmas cake recipie for my finacé. He’s very particular about what ingredients he wants in it as he doesn’t like nuts and things. Aparently his Grandfather used to make the best one and as this is our first christmas together with our new baby I would love to make it extra special. It might sound silly but would the cake be the same if I was to miss out some ingredients? Or are there alternatives to the almonds, dates and figs? Hi, I remembered reading this post a few weeks ago, but today I was asked about making Christmas Pudding, would you recommend soaking the fruit for weeks to make a christmas pudding or is it a completely different kettle of fish when making Christmas pudding rather than Christmas cake? Have I left it too late to start soaking my fruit? Delghted you are posting this cake again this year – I still have my fruit soaking from last year!!! I am going to try it for the first time, it isn’t something Dutch so i am curious if i will manage all the decorating stuff. I was already reading the cake recipe from last year. It contains mixed cake spices. i do live in the Netherlands and i do want to know wich spices it contains, Is it à mixture with cinamon, coriander, nutmeg, cloves, ginger and cardemom? This kind of mixture we use in Holland for our speculoos or is it something completely different.? This is old Cowboy from Texas. Could you or someone please email me the measurements for the cake conversion from UK to US. I love the idea of soaking the fruit for 6 weeks. However i live in Australia where it is beginning to get humid. Is it alright to store the soaked fruit in the fridge? Depending on whether you did 1x quantity of boozy fruit or more 1.5x etc I’m not sure? You will need to make up the same multiplied quantity of the basic cake mix too. 1 x mix makes 1 x 8″ cake or 2 x 4 – 6″ (round) cakes depending on how deep you want them. If I’m making smaller cakes I tend to make up the whole lot into cake mixture and then divide it between a selection of tins. Arrgh! I want to make a Christmas cake, but it’s just 8 days away. Am I too late? Should I soak fruit for a couple of days, or just cut to the cake making?? If I decide to add nuts, I know from a previous comment that I should add them to the mix just before baking. However should I make the same quantity of soaked fruit and add the nuts on top of that, or make less fruit to compensate for the nuts? I have NEVER made a Christmas cake before, and I’m really excited about trying it, but my other half doesn’t like nuts, can I substitute them for dried Apple (like his nan used to make) or will I have to subtract from the other dried fruit and just omit nuts entirely? 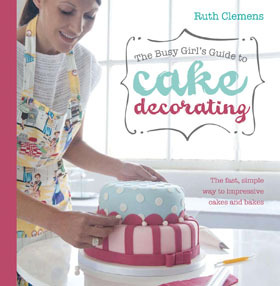 I too am just about to have a go at this as a first time Christmas cake maker (!! ), I want to add nuts – do I add them after the soak or do they get soaked with the fruit? Also, do I count the nuts in as fruit for the total 730g weight? Thanks very much, I’m super excited to be trying this! Brilliant, thanks for the reply – how many grams should i use, i can’t seem to find it in the recipe and wouldn’t have a clue, i don’t want to ruin it! Hi,cant wait to make this cake but my tin is 10″ round, help! Hi Ruth, I came accross your website on a google search,love your website. 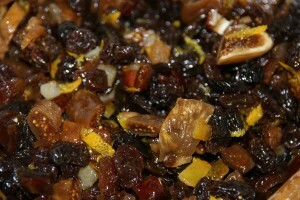 I have just soaked my fruit today to make my xmas cake, thank you for a excellent recipe. I will let you know how my cake turns out. Hi Ruth:o) I made the Jewelled fruit last week but with no alcohol as I’m a mum of 5 and I just know if I made it with alcohol it would never get eaten! I love the stirring part so much! It smells beautiful and is glossy and sparkly and is in essence just what christmas is about. Wonderful and I cannot wait to start the actual cake. Thanks for showing fabulous information. Hi Ruth I only just found your website, love it. I am trying your Christmas cake. I am a first timer. Have soaked my fruits a bit late but as you said, a week is better than none at all. Just a small question, what do I with the soaked brandy, do I use it again in the cake mixture? Hi Ruth,1st time trying your recipe,I only needed a small cake, only problem just weighed my fruits and it only ways 124g I will be adding glazed cherries to this amount,so maybe round of 130g approx I was just wondering please, shall I decrease the mixture (flour/butter/sugar)accordingly or go with your measurements still? Thanks. Hi just added 200g of cherries so total fruit 324g do you think I should half your flour, butter and sugar? 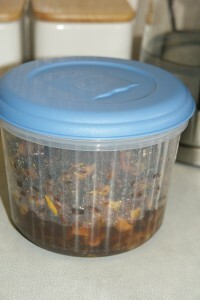 Can I freeze some left over dried fruit which has been soaked for 2 weeks? 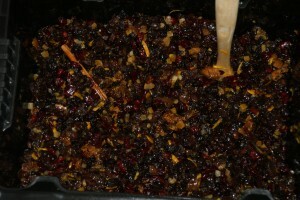 My sister soaks the ingredients for her fruit cakes in vodka and brandy (one cakes amount per spirit) for 6 months with sugar syrup then when it’s time to bake the cakes (she does this a day before decorating stages, no need for more feeding) pours excess alcohol into bottles and gives as Christmas fruits spiced drinks, double duty cake and flavoured spirits. Thought you would like this idea. Hi Ruth, my family love your Christmas cake so much that my sister wants it for her wedding cake. What multiples & timings should I use for a 12 & 10″ cake please? Thank you in advance!